My first experience in deboning the chicken without having to damage the skin was fun and it took me about half an hour to complete the task. After having done that , I stuffed the chicken with some ingredients I found in the fridge that I know would be great for the chicken.....green apples, fresh cranberries, carrots, potatoes, fresh brown button mushrooms, onions, sausages and I added in some croutons to make up the bulk to fill up the chicken. But the most important thing in this roast chicken is not the stuffing so much but the red wine marinade . 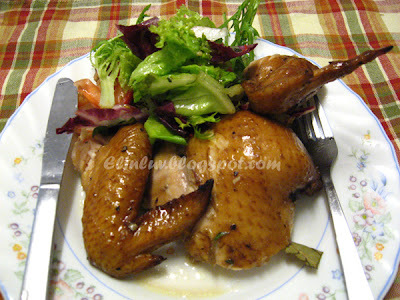 Before stuffing the chicken, rub some rosemary garlic butter mixture on the under skin of the chicken for extra flavor. 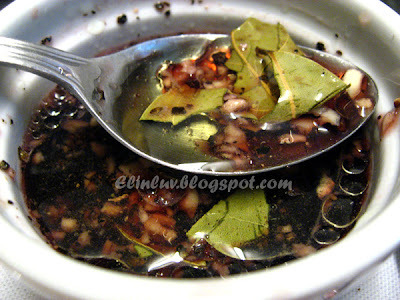 The red wine marinade consists of bay leaves, red wine, red wine vinegar, olive oil, black pepper and garlic. After the chicken has been stuffed with the sauteed ingredients , I used bamboo skewers to seal the neck and bottom part of the chicken. After which I marinate the chicken with the red wine marinade for an hour. Roast them in preheated oven at 200 C for 1.5 hours until it is golden brown and cooked. Make a salad to go with the roasted stuffed chicken . 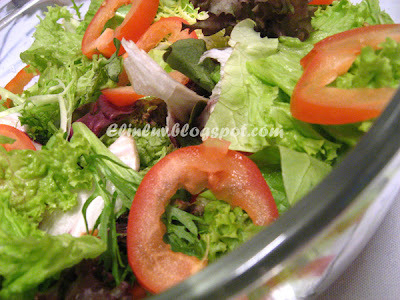 balsamic vinaigrette for this salad...yummy ! Fabulous looking dinner! 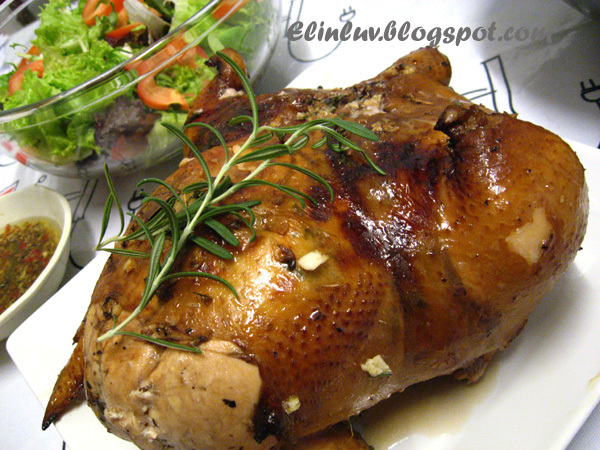 Juicy aromatic roast chicken with a healthy crisp salad! Oh wow, what a way to start the end the year with plump and juicy stuffed chicken!! We will have roast chicken for dinner at least week because Carlos like it. Less cooking and clean up for me. Yea blogging brings us a lot of new friends locally and from all over the world. I am glad that I know you Elin. Drool... What did I have? Porridge! Sobssss.....missus did not bother to cook anything special. This year, I'll spend Christmas and New Year in Ipoh. Hint! Hint! LOL!!! Happy New Year to you & your family,, Elin! What a hectic season huh! Time just flies so quickly and school going to reopen tomorrow. Another busy week! Not forgetting the Chinese New Year will be arriving in another one month time. :P More spending! Hope you're enjoying your evening. 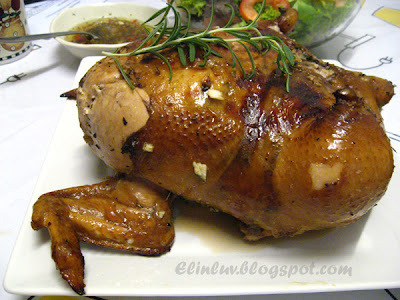 Btw, your roasted chicken looks absolutely marvellous! Thanks for sharing. The stuffed chicken looks absolutely good for the new year celebration. Happy New Year to you and all your piggy members!